Frozen 2PN and day 3 embryos are rapidly thawed and cultured in blastocyst culture media until they develop into blastocysts (Figure 21.1). Unless they are to be manually dissected (see below), the blastocysts are allowed to hatch, or induced to hatch by applying Acid Tyrode's solution with a micropipette on day 5 or 6. Alternatively, laser-assisted hatching can be used. Embryos that were frozen at the blastocyst stage are thawed and cultured overnight in blastocyst culture medium for re-expansion and hatching. 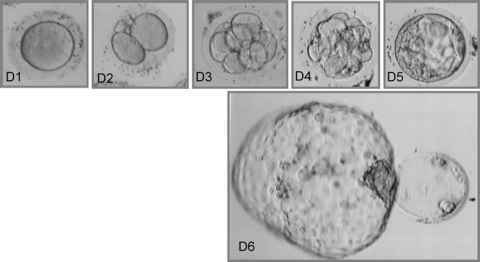 Figure 21.2 A variety of hatched blastocysts. The ICM is indicated by the arrow in each photo. Figure 21.3 Dissection of single blastocysts. The embryo is cut with a microblade (left and middle) and the ICM is separated from the rest of the blastocyst (right). There are several approaches to initiating culture of ICMs. The blastocysts can be cultured directly after hatching, subjected to immunosurgery (see Alternative procedures, below) or manually dissected. We favor a manual dissection, which appears to improve the viability and attachment in the initial stages of culture. Figure 21.2 shows a variety of hatched blastocysts. Embryos are placed in Splitting Medium and orientated such that the ICM is towards the biopsy pipette with a biopsy blade adjacent to it (Figure 21.3). The ICM can be partially or completely pulled into the biopsy pipette. The biopsy blade is then used to carve away the trophectoderm cells from the ICM, releasing the ICM cells into the pipette. optical properties (Figure 21.4). Small colonies can be visualized in the limited volume of medium, and the shape of the wells makes it possible to dissect colonies with micro tools. IVF dishes are coated with Matrigel (Becton-Dickinson; growth factor reduced). 1. Thaw Matrigel on ice to prevent gelling then dilute 1:30 in knockout D-MEM. 2. Coat center well with 0.5 mL Matrigel solution for 1 h at room temperature or overnight at 4°C. 3. Aspirate Matrigel from IVF dishes and add 1 mL of medium to the center well. 4. Equilibrate the medium in the incubator. 1. Release the embryo or dissected ICM from the pipette and place it into the Matrigel-coated IVF dish containing 1 mL of medium. 2. Return the dish to the incubator. 1. Add feeder cells (mitotically inactivated human fibroblasts) to the culture dish without disturbing the embryo. Calculate the number of cells added so that the feeder cells are the same density as used for normal hESC culture. Note: We use HS27 (human foreskin fibroblasts from ATCC) or hESC-derived fibroblastic primitive endoderm cells at a concentration of 50 000-100 000 per IVF dish. 2. Suspend the appropriate number of cells in about 250 pL of medium and gently add it to the culture dish. If the volume in the dish is already near capacity, remove 250 pL of culture medium from the dish before adding the cells. 3. Add bFGF to the medium to a final concentration of 20 ng/mL. 1. Growth factors are refreshed every day by adding the same amounts that were present at the original concentrations given in the recipe section. 2. The remaining factors are added only when fresh medium is added. 3. Approximately 40% of the culture medium is removed every alternate day and replaced with 50% of fresh culture medium. This discrepancy in volumes is due to the fact that there is always some loss of medium due to evaporation. 4. Always maintain the final concentrations of growth factors by replenishing them every day. 5. Typically healthy ICMs should attach within 3 days Replacing medium for ICMs which have not attached immediately can be done carefully, and is discretionary. 1. Passage the cultures every 7th day. 2. Replace medium in the dish with 1 mL fresh complete medium. 3. Mechanically scrape the attached ICM or subcolonies off the IVF dish with sterile insulin syringes while viewing under a 10X or 20X objective with an inverted phase contrast microscope. The lower magnification afforded by dissection microscopes may not be adequate to view the smaller colonies. 4. Transfer the colonies suspended in the fresh medium into a new IVF dish ('current dish') with an established feeder layer. 5. Retain the old dish ('previous dish') - add 1 mL of fresh complete medium. Frequently colonies remain in the dish that housed the previous passage. 6. Replace both dishes in the incubator. Note: For subsequent passages colonies from both the previous and current dish are pooled and the previous dish discarded. ■ Establishing a line is a slow process, and it may be several months before a line is stable. In order for the culture to be designated as a cell line it must be successfully frozen and recovered from a frozen stock. ■ When the population has expanded to at least 20 moderate-sized colonies, cryopreserve 8-10 colonies. We use a standard hESC freezing protocol, but others have had success with vitrification. ■ Maintain the frozen vial for at least a week, then thaw and culture the cells. ■ If you obtain about 80% recovery from freezing, there is a good chance that a stable line is established. ■ Continue to expand the cells until several vials can be cryopreserved, then characterize the cells for hESC phenotype. ■ We recommend that new hESCs be tested for the presence of diagnostic markers (SSEA4 and POU5F1/OCT4) by immunofluorescence, and karyotyped as soon as possible. ■ The differentiation capacity should be tested in vitro and in vivo, and compared with a well-characterized hESC line to obtain a basic comparative profile.